My Christmas gift to my mother this year was a handmade quilt. But it wasn’t just another blanket to keep her warm on a cold evening while watching the ballgame. 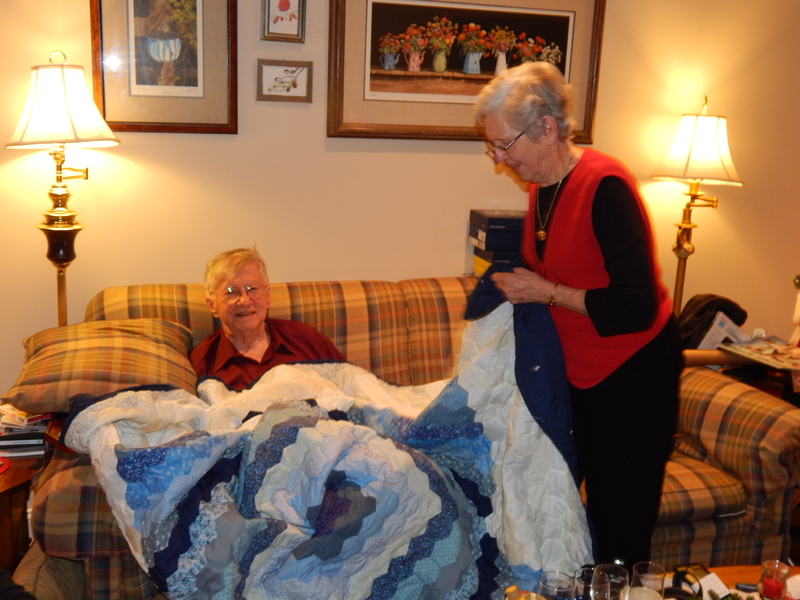 The quilt was the completion of a family heirloom that was started many decades ago. With her characteristically painstaking precision, my grandmother pieced together this fabulous blue “Lone Star” quilt top over 60 years ago. But due to a death in the family, she had to put it away to make time to take care of the home, the farm and to prioritize the many other responsibilities that stood in the way of her completing the quilt. Though she started and finished many other sewing projects after her retirement from the farm and a long career in nursing, she passed away in 2007 without ever getting back to this particular piece. 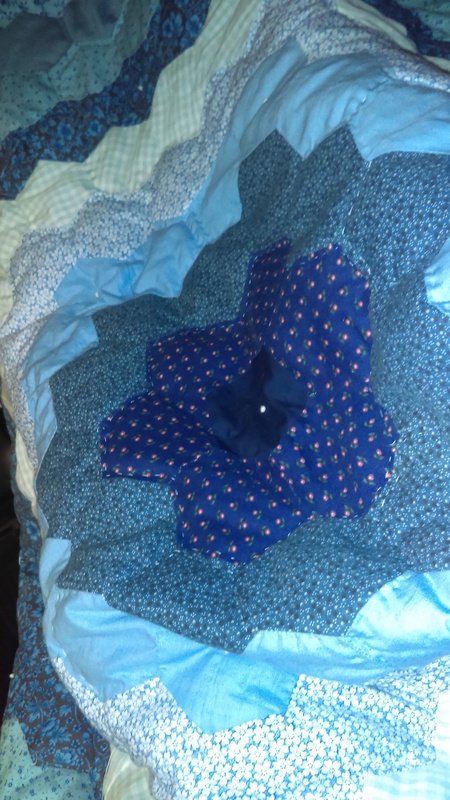 A few years later, Mom gave me a box of keepsakes from my grandmother’s estate and since she knew that I like quilting too, I became the recipient of the unfinished work. For 6 or 7 more years, it lay untouched in the box that was stored away on a shelf in the basement. Then, one summer, I had some extra time and decided to get it out to see what could be done to bring the project back to life. After soliciting Mom’s help with laying it out and pinning it up, I started the long process of hand stitching each one of the hundreds of sections. But as homeschool started back that fall and other demands pushed sewing lower on my priority list, the quilt once again lay dormant until this past Thanksgiving. 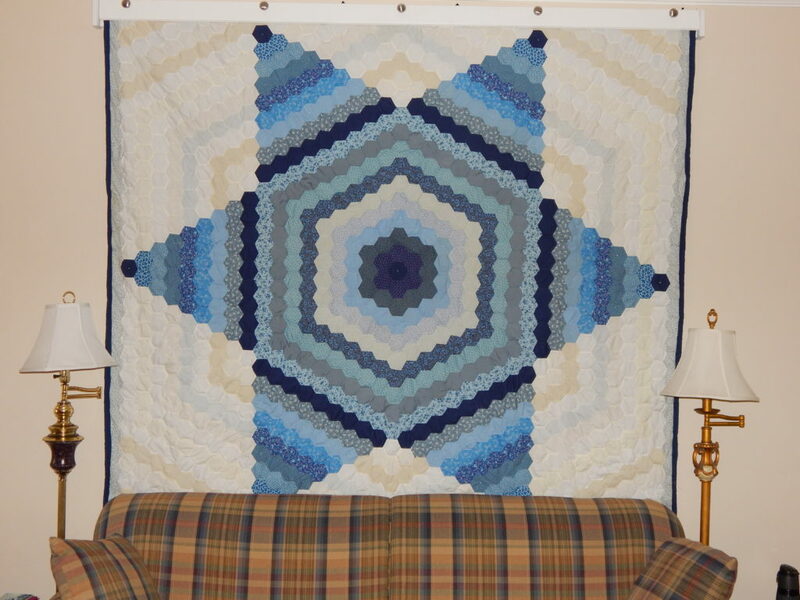 With the goal of completing it as a gift, I once again pulled it out from the corner of the closet, brushed off the dust, and sat down to quilt every night until I finished it four days before Christmas. You know, while racing through the ‘fast-paced, get-it-done-in-record-time’ world and which we live today, people rarely take the long view of things. If we can’t see a project completed in 2.5 months (or less) we’re quick to forget it and move onto something else. But the lesson that I learned from finishing my Grandmother’s quilt is that sometimes God assigns you to begin a project that will be passed onto others to complete. Today, there are vast numbers of people who are called to plant churches who never see them grow beyond a few members, individuals who have a vision for a new company or service that struggle to build it all their lives, and believers who pray diligently and work tirelessly to root others in faithfulness, but never see the fruit of their efforts firsthand. Though everyone loves to be around for the final reveal, followers of Christ need to focus on stewarding our part of the job to the best of our ability and then learn to leave the end of the task to God. 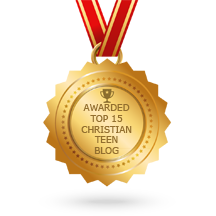 I love this blog because it reflects practicality and experience. Thank you Karen for sharing. In my seventh decade, and loving and serving the Lord since I was six years I have experienced through the years including service in 4 Churches (2 pioneers) at times breaking new ground, sowing, fertilizing, pruning and reaping. It is painstaking, seeing in part and not the whole. It takes faith AND action to accomplish His perfect will. It surely is satisfying to us and to His glory when He gives us vision and fruition of the whole. Praise the Lord He chose us, weak as we are, to reveal His beauty, strength and omnipotence, omniscience and omnipresence in our lives. Amen! So grateful to be used by Him in any small or large way to open the way for others to know the magnificence of our Great God! Blessings on the seeds you have sown and the hearts that have been cultivated!